NSFA, Panacan, Davao City – Eastern Mindanao Command (EMC) achieves another milestone as it was recently conferred Proficient, the third level in AFPTR Institutionalization Pathway, during the AFPTR Governance Forum-Lecture Series 01-17 and AFPTRIP Awarding on March 13, 2017. Present during the awarding ceremony was EMC Commander LTGEN REY LEONARDO B GUERRERO AFP who personally witnessed the pinning and received the Gold Governance Trailblazer Certification award of the Command for garnering 93.35% average rating. Prior to the awarding, EMC have undergone validation and inspection. 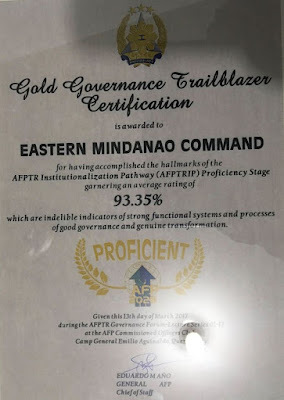 It could be recalled that EMC was visited by the OSSSM Audit last February 23, 2017 during their on-site audit for Proficiency Stage at the Command. The Audit team checked the functionality of the governance and strategy mechanism of EMC. 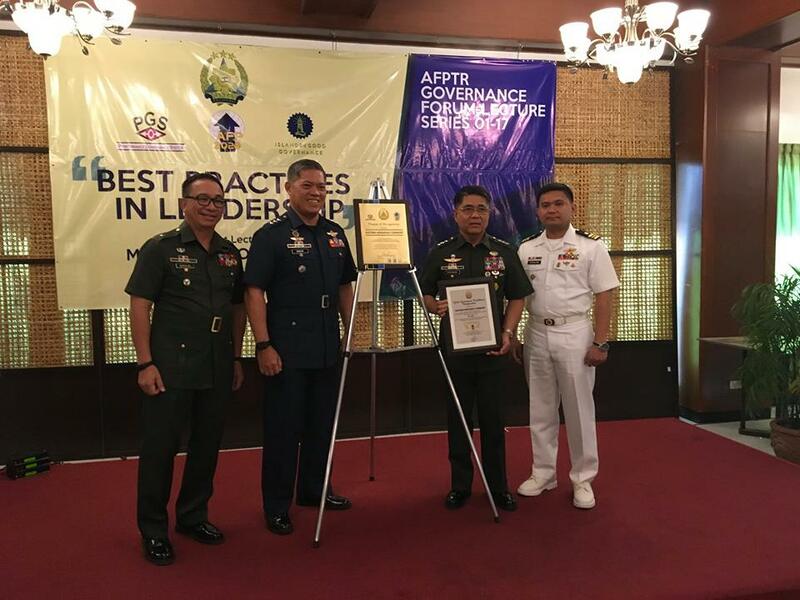 Further it had undergone scrutiny during the revalidation on March 2, 2017 at Headquarters Armed Forces of the Philippines.